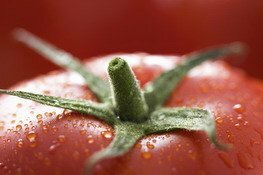 Tomato facts: what are the health benefits of tomatoes? 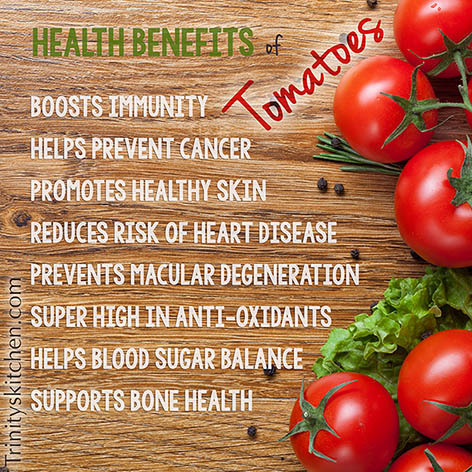 Check out these tomato facts that make this popular food a nutrition powerhouse! Nutrients in tomatoes make them heart-healthy, diet-friendly, excellent for preventing many forms of cancer and other diseases, and provide numerous additional health benefits. Since a tomato has 0 grams of cholesterol, it doesn’t add cholesterol to the diet. Plus, a cup of fresh tomato provides 9% of the DV for fiber, which has been shown to lower high cholesterol levels. Tomatoes are also a good source of niacin (vitamin B3), which has been used for years as a safe way to lower high cholesterol levels. Tomatoes are a very good source of potassium. Diets rich in potassium have been shown to lower high blood pressure and reduce the risk of heart disease. Vitamin B6 and folate, each present in tomatoes in good amounts, are both needed by the body to convert a potentially dangerous chemical called homocysteine into other, benign molecules. High levels of homocysteine can directly damage blood vessel walls and are associated with an increased risk of heart attack and stroke. In clinical research conducted by Dr. Esther Paran, M.D. at Ben Gurion University (Beersheva, Israel), tomatoes were linked with a significant drop in blood pressure. After 8 weeks, ongoing tracking of daily tomato ingestion (in the form of lycopene complex – a tomato extract) showed a drop in both the blood pressure top number (systolic) by 10 points and the bottom number (diastolic) by 4 points. Nutrition experts agree: tomatoes are an outstanding source of the antioxidant lycopene. Antioxidants travel through the body, neutralizing dangerous free radicals that could otherwise damage cells and cell membranes. Free radicals escalate the progression or severity of atherosclerosis, diabetic complications, asthma, and colon cancer. High intakes of lycopene have been shown to help reduce the risk or severity of all of these illnesses. Studies show that eating tomatoes reduce the risk of many cancers, and prostate cancer in particular. In study from the Journal of the National Cancer Institute, animals on an energy-restricted, tomato-based diet showed a 32% drop in their risk of dying from prostate cancer. Credit goes to antioxidant lycopene working together with other phytonutrient compounds in tomatoes. The overproduction of free radicals within cells boosts inflammatory compounds. These compounds promote virtually all chronic degenerative diseases, including atherosclerosis, cardiovascular disease, osteoporosis, and Alzheimer's disease along with various cancers. High amounts of antioxidants lycopene and beta-carotene in tomatoes neutralize free radicals and help reduce inflammation. Tomatoes are a good source of chromium, which has been shown to help diabetic patients keep their blood sugar levels under control. Acidosis, according to the medical community, is a common cause of calcium loss, fatigue, headaches, sleeplessness, muscle aches, acne, eczema, arteriosclerosis, sexual dysfunction, hormone imbalance, depression, and many degenerative conditions. Our bodies are designed to maintain an alkaline balance with a pH of 7.365. Yet diet and poor exercise habits mean our bodies are over-acidified. By including plenty of alkaline minerals in our diets – calcium, magnesium, potassium and sodium – we help our body maintain its alkaline balance naturally. Tomatoes are excellent sources of calcium, magnesium, and potassium and can aid in preventing acidosis. Tomatoes are a good source of riboflavin, which has been shown to be helpful for reducing the frequency of migraine attacks. Tomatoes have been credited by experts with helping to avoid flu and colds, especially for males. According to the medical community, these common illnesses are widely believed to be rooted in carotenoid deficiencies, including low amounts of lycopene and beta carotene in a patient’s system. Drinking tomato juices assists in building defenses against colds and flu. Researchers at the University of Dusseldorf (Germany) observed subjects who consumed tomato paste for a minimum of 10 weeks. Absorption of UV rays was 40% lower than subjects in the control group, showing lycopene in tomatoes works as a natural sunscreen and provide protection against UV rays. A serving of tomatoes provide 18% the daily value for vitamin K, which promotes bone health. Vitamin K activates osteocalcin, the major non-collagen protein in bone. Osteocalcin mineralizes calcium molecules inside of the bone. In other words, vitamin K in tomatoes helps osteocalcin do its work to harden calcium and make bones strong. Vitamin A is essential to maintaining the health of the retina. Its deficiency contributes to the development of night blindness. A one cup serving of fresh tomatoes provides 30% DV of vitamin A, a high concentration which prevents necessary shortage and promotes eye health. 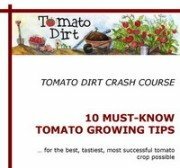 Tomato nutrition facts: what nutrients are in tomatoes?